Already in a committed relationship with your editor? No problem. Ignite Pro gives you over 180 plugins to fire up your software of choice. Experiment with over 550 visual effects, presets and the industry's best suite of 360° filters. No strings attached. No arbitrary restrictions. No time limits. Ignite Pro neatly plugs into any host or workflow for hassle-free editing on your MAC or PC. Every license gives you 3 seats, so you can use Ignite Pro at home, in the studio, or on the beach- no sweat. Bring your content to life from every angle with Ignite Pro's top-of-the-line 360° filters. Designed specifically for 360° video, our new range of 360° VFX ensure your edits are free-from patchy seams, grainy textures or distortions. You can even use the 360° viewer to see and interact with your effects from any direction. Don't have a 360° camera? No problem. Use Ignite Pro's Fisheye Converter to turn standard Fisheye images into stunning panoramic shots. Easy 360° looks, no pricey equipment required. Intensify your action scenes with weapons that cut and fire from every angle. Secure a victory for the Rebel Alliance with double-bladed 360° Lightswords, or scale up your Stormtroopers' arsenal with 360° Animated lasers. Don't let your background steal the spotlight. With Ignite Pro's 360° Blur you can highlight the elements you need to tell your story and blur out the rest. Have a more complex look in mind? Use 360° Channel Blur to individually blur each channel on a layer. Invoke the power of 360° Unsharpen to (counterintuitively) sharpen blurry or less-than-perfect shots. Clean up your green screen footage with Ignite Pro's effortless broadcast-quality Chroma Key. Get high-quality removal from blue or green screen, control over edge detail, color correction and advanced spill replacement. Ignite Pro's unique spill simulation plugin replaces unwanted light reflections from your green screen with simulated light from your new background. You can even add the Light Wrap effect for a more realistic light bloom around your foreground elements. Turn a dreary London sky into a California dream by extracting black or white background with Ignite Pro plugins like Luminance Key and Demult. Perfect for stock footage, these enhance vibrant colors and darken edges for more texture in your scenes. Sometimes keying only gets you halfway to perfection. Use the Matte Cleaner plugin to put the finishing touches on your composite through smoothing, feathering and choking the edge of the key. Enter 'the grid' with Ignite Pro's atomic particle systems. Images and 3D model surfaces easily morph into point grids that respond to animation or sound. Use Atomic Particles to create Tron-style holographics, fractal distortions, dramatic dissolves or animations synced to your favorite track. Create earth-shattering scenes with Ignite Pro's video-shattering plugin. Break up videos and images into bricks, shards or any custom shape. Make your title sequences explode on screen. 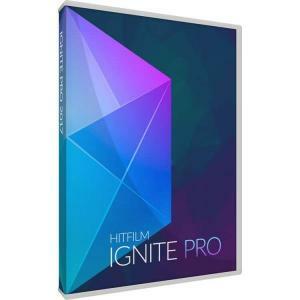 Perfect for any action scene - Ignite Pro's dedicated, 3D muzzle flash engine incorporates a huge library of customizable effects. Drag and drop realistic, infinitely variable muzzle flashes onto any weapon in your prop collection from any angle, and at any size. Don't let rogue pedestrians come between you and your perfect shot. Clean up your footage by easily hiding or duplicating objects with Ignite Pro's clone stamp and replacement tools. Make your own Towering Inferno with Ignite Pro's procedural fire effects. Augment your stock footage with everything from small bonfires to large-scale building fires. Perfect for turning up the heat and production value. Ignite Pro's distortion effects come in four flavors: Heat, Energy, Smoke & Fluid Distortion. Add industrial grit to your props and environments with jet exhausts, burning fires and hot proton beams, or create your own Narcissus reflection scene with fluid caustics- perfect for creating the appearance of looking through a liquid surface within the software. Create stunning neon sign graphics straight out of a dystopian metropolis or middle-of-nowhere motel. Just add the neon effect to text and shape layers to create life-like neon sign graphics that interact with surrounding elements.Bonus: Neon Path significantly reduces time spent rotoscoping lightswords and laserbeams. After positioning your lightsword using the 4-Point Auto effect, enhance it with Flicker, foreground & background distortion for an irregular edge, glow and path animation. High-quality visual effects are the building blocks of modern sci-fi classics. So we've created a showstopping repository of classic sci-fi tropes - from starfields and lasers, to FTL-jumps, text crawls, earthquakes and even Lightswords. Drag, drop and dazzle. Tell more stories in a New York minute with a temporal palette that lets you speed up, slow down or reverse the action. Bring your scenes to life by having characters dodge bullets with motion blur, or bend time with echoes, motion trails and temporal displacement. Take up the mantle of Nikola Tesla with your very own lightning generator. Get your characters to wield Harry Potter wand effects, explode star systems or throw electric bolts with customizable branches, color and motion. Twist and distort your footage for that added cool factor using Ignite Pro's Vortex Displacement, Bezier, Perspective and Polar Warps. Flatten your action footage to match your traditional lenses or use Action Cam Lens Distort; making it easy to layer your composites directly onto footage filmed with action cameras. Get the J.J. Abrams look without having to adjust F-stops or shine a maglite into your camera. Volumetric, Anamorphic and Automatic Lens Flares are all easy to use with automatic identification and application of flares to bright spots in your layers. Ignite Pro even simulates imperfect lens flaring from specular highlights, camera dirt and anamorphic streaks. Colorist's toolkit Turn your editor into a Colorist's dream-come-true with Ignite Pro's grading and color correction plugins. Modify and analyze your frames with Color Cycle, Color Map, and Color Phase. Tinker with features like Duo Tone & Tint, Hue Colorize & Hue Shift, Shadows & Highlights, Color Vibrance, Vignette & Vignette Exposure to get the perfect shot.